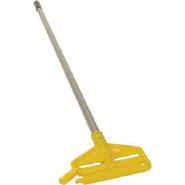 The Invader® Mop Handle is for wet mop heads and is designed to make attaching and removing the mop head fast and easy. The Invader has a side gate handle that fits 1" headband mops. The thumb wheel holds the mop head firmly in place.